George Chewning, a second-year graduate student in the business school, helped pass a bill to create a memorial for those who have lost their lives in the War on Terror. 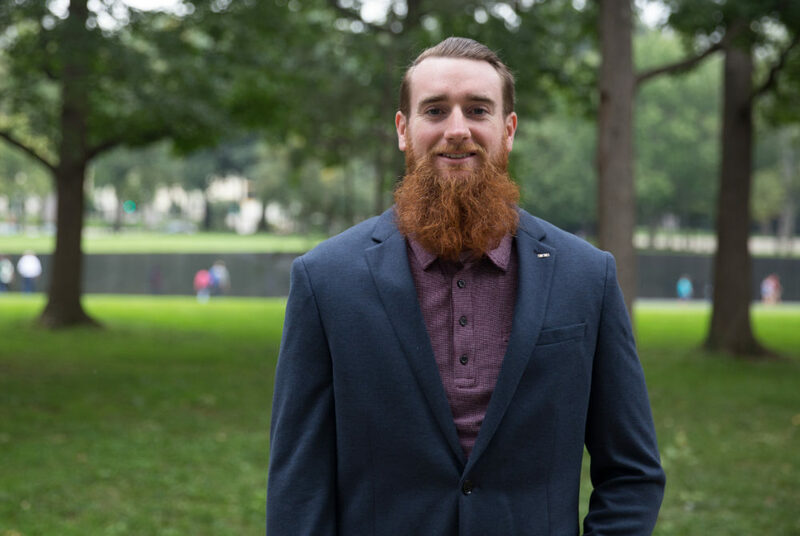 NEWS By Meredith Roaten Sep 13, 2017 11:55 PM It’s hard to miss George Chewning, a towering second year MBA student who sports a bushy, red beard sprouting from his face. It was that beard – and Chewning’s passion for the subject – that senators and representatives remembered when they voted last summer to build a memorial to those lost in the War on Terror, colleagues said. Andrew Brennan, the founder of the Global War on Terror Memorial Foundation, said that without Chewning as the group’s director of governmental affairs, a bill authorizing a monument on the National Mall to be built by 2024 would have never passed so quickly. Brennan said he started the organization in 2014 after deciding to challenge an existing law banning federal memorials from being built until a decade after the war they are memorializing has ended. He spent two years pulling together a team, making the organization public and then started lobbying last year. In July, the bill was approved by both houses of Congress and President Donald Trump signed it into law last month. It wasn’t only Chewning’s unique look, but his work ethic and passion for the issue that made his lobbying so effective and pushed the issue to the floor of the House and Senate, Brennan said. The memorial has support from various veterans organizations like Team Red White and Blue, the Wounded Warrior Project and Team Rubicon, but Brennan said it will need all the help it can get to raise the $40 million in donations needed to build the monument. After Chewning returned about a year ago from a deployment in Afghanistan as an Army operations planner, Brennan’s sister reached out to him to help with the memorial project because she knew he was attending GW and would be in D.C. He said Chewning was eager to help. He said Chewning shadowed an experienced team member from the group in a few meetings with senators before he was thrown into one-on-one conversations himself, trying to convince organizations and representatives to back the legislation. Chewning, who studied sociology at West Point and then spent five years in the Army, had no prior political experience. “It was tough at first because I had just come from the Army and had never done anything political before, so I was just learning on the job which was exciting,” Chewning said. It wasn’t a hard sell, but he said he told everyone he met with that it was so important to memorlize fallen soldiers and educate people about the war. Chewning said the work was an opportunity to give back to the veteran community after he put away his uniform. He said the lobbying effort was worth it because if he hadn’t convinced elected officials to back the project, people who dedicated their lives to the war might not have received the recognition they deserve – at least not on the hallowed ground of the National Mall. “Their families say they understand what happened over there, but this is really a chance for them to have a conversation about it and come to the nation’s capitol and share with their brothers and sisters and families in that experience,” he said. Now, as the organization turns it’s attention to getting the memorial built, the group wants to involve as many veterans as possible in the process of designing the monument and selecting a site on the Mall, he said. This article appeared in the September 14, 2017 issue of the Hatchet.